When I moved to Boston as an adult, I was still a street photographer and some-time photojournalist in search of decisive moments and unusual faces. I explored Boston’s Fish Pier and the drydocks in East Boston hunting for photographs in the same way that I roamed about Manhattan’s Fulton Fish Market in my teen years. Several times I asked fishing boat crew members if I could join them for a photography day trip. They always turned me down, explaining that insurance policies would never permit it. I knew little of the real dangers confronted by commercial fishermen. “The Deadliest Catch,” a cable television show about the hazards of crab-fishing in the Alaskan Bearing Sea would not air for a couple of decades. 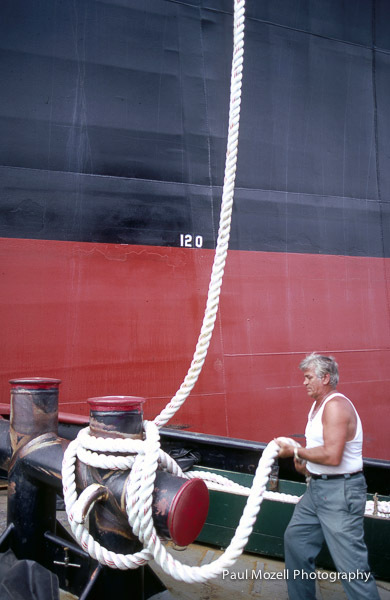 One bright morning, with papers in hand identifying me as a stringer (freelancer) for The Associated Press, I was able to convince the skipper of a tug to invite me on board. And so began an 8 hour day of chugging around Boston Harbor. I had no lunch, water, or sun protection, only a bag full of cameras and a sense of adventure. A crew of two or three men handled the lines on deck and did their best to keep the innocent photographer out of harm’s way. It wasn’t until late in the afternoon that the skipper received a radio call requesting his assistance with a tanker. Our tug worked in concert with a few other tugs; communicating with each other with a blend of whistle toots and radio calls. With care and precision the huge vessel was guided through the channel. It was the realization of a small, fun dream. boston harbor, commercial, fishing, freighter, tanker, tug boat, tugboat. Bookmark.